NEW YORK (AP) Yankees manager Joe Girardi was hoping CC Sabathia would give one of those performances that has made him one of the most dependable pitchers in baseball - his bullpen really needed a break. Sabathia steadied New York's rocky rotation with eight sharp innings, Alex Rodriguez passed Willie Mays for eighth on the career RBIs list and the Yankees beat the Detroit Tigers 6-2 on Sunday despite leaving an astonishing 14 men on base in the first six innings. ''It just feels good to go out there and give those guys a rest,'' Sabathia said of a 'pen that had thrown 73 1-3 innings entering the game, third most in the AL. He singled on a dribbler down the third base line with the bases loaded in the second, the Yankees' only hit in six plate appearances with three men on. Chris Stewart slid under catcher Gerald Laird's tag on Rodriguez's grounder to short in the seventh. Curtis Granderson homered in the fourth inning - barely. He had to stop between second and third to look back after center fielder Austin Jackson nearly made a spectacular catch above the wall in right-center. Granderson also walked with the bases loaded to force in the game's first run in the second, one of a career-high seven walks by Detroit starter Max Scherzer (1-3). Swisher has a low grade strain and will be out several days. Giradi says it's not serious enough for a trip to the disabled list. The big lefty had little trouble with the Tigers - all except for Fielder and his nemesis Miguel Cabrera, who hit a long RBI double in the sixth inning to close it to 3-2. Cabrera is 10 for 19 against Sabathia. 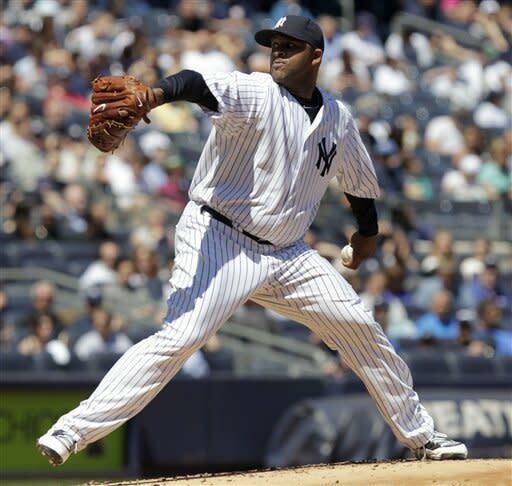 Sabathia struggled early to a 5.27 ERA on a staff with a 6.37 ERA, 29th in majors, entering Sunday. Garcia was dropped from the rotation before Sunday's game and rookie David Phelps will get a start before the expected return of Andy Pettitte in mid-May. ''When you have your ace on the mound and you talk about trying to win all the series and you're tied 1-1 you feel pretty good going into that day,'' Girardi said..
With one out, Granderson connected but Jackson made a long run and leaped where the outfield wall meets a fence that separates fans from the New York bullpen in right-center. The former Yankees minor leaguer who was sent to Detroit in the trade for Granderson had the ball in his glove but momentum carried the glove into that fence, knocking the ball loose for Granderson's eighth homer. ''I didn't see what happened right away,'' Granderson said. Putkonen gave up Rodriguez's fielder's choice RBI in the seventh. Collin Balester relieved and gave up a sacrifice fly to Robinson Cano. Putkonen walked two. NOTES: The major league record for runners left on base is 20 for a nine-inning game, set by the Yankees in 1956. ... Jeter's two infield singles gave him 36 in April, topping the best April of his career, 35 in 2006. 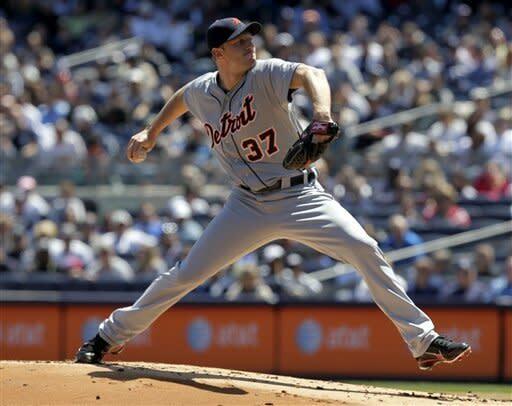 ... Tigers RHP Doug Fister (left side strain) will make a rehab start Wednesday for Triple-A Toledo. ... Cabrera has hits in 31 of 33 games against Yankees. Brennan Boesch had two hits and has hits in 13 of 15 games against New York.